A glove (Middle English from Old English glof) is a garment covering the whole hand. Gloves usually have separate sheaths or openings for each finger and the thumb. If there is an opening but no (or a short) covering sheath for each finger they are called fingerless gloves. Fingerless gloves having one large opening rather than individual openings for each finger are sometimes called gauntlets, though gauntlets are not necessarily fingerless. Gloves which cover the entire hand or fist but do not have separate finger openings or sheaths are called mittens. Mittens are warmer than other styles of gloves made of the same material because fingers maintain their warmth better when they are in contact with each other; reduced surface area reduces heat loss. Fingerless gloves are useful where dexterity is required that gloves would restrict. Cigarette smokers and church organists often use fingerless gloves. Some gloves include a gauntlet that extends partway up the arm. Cycling gloves for road racing or touring are usually fingerless. Guitar players often use fingerless gloves in circumstances where it is too cold to play with an uncovered hand. Gloves are made of materials including cloth, knitted or felted wool, leather, rubber, latex, neoprene, silk, and metal (as in mail). 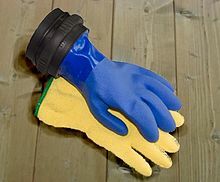 Gloves of kevlar protect the wearer from cuts. Gloves and gauntlets are integral components of pressure suits and spacesuits such as the Apollo/Skylab A7L which went to the moon. Spacesuit gloves combine toughness and environmental protection with a degree of sensitivity and flexibility. Three finger army shooting gloves. Leather gloves have been worn by people for thousands of years. The unique properties of leather allow for both a comfortable fit and useful grip for the wearer. The grain present on the leather and the pores present in the leather gives the gloves the unique ability to assist the wearer as they grip an object. As soft as a leather glove may be, its pores and grain provide a level of friction when "gripped" against an item or surface. Lambskin is widely used for fashion gloves and it is casual and country gloves. It is the most used material for gloves made in Europe in the known as French style. A dark leather glove became an important piece of evidence in the O. J. Simpson murder case. Simpson's defense counsel famously quipped "if it doesn't fit, you must acquit". The glove presented as evidence shrank from having been soaked in blood, according to some analysis. ^ James W.H. McCord and Sandra L. McCord, Criminal Law and Procedure for the paralegal: a systems approach, supra, p. 127. ^ "The History of Herodotus by Herodotus, Volume VI, at". Classics.mit.edu. Retrieved 2010-03-16. ^ "Pliny the Younger: Selected Letters". Fordham.edu. Retrieved 2010-03-16. ^ J. R. R. Tolkien, ed. Ancrene Wisse, 8. The English Text of the Ancrene Riwle: Ancrene Wisse (Early English Text Society, CCXLIX) London 1962, noted by Diane Bornstein, The Lady in the Tower (Hamden, Connecticut) 1983:25 note 4. ^ Marjorie O'Rourke Boyle, "Coquette at the Cross? Magdalen in the Master of the Bartholomew Altar's Deposition at the Louvre" Zeitschrift für Kunstgeschichte, 59.4 (1996:573–577) assembles numerous historical references to gloves, with bibliography. ^ Étienne-Martin Saint-Léon, Histoire des corporation de métiers depuis leurs origines jusqu'à leur suppression en 1791 (Paris) 1922, noted by Boyle 1996:174:10. ^ "Other [Wiltshire] industries". British History Online. Retrieved 26 July 2015. ^ Roy C. Strong, Portraits of Queen Elizabeth I (Oxford) 1963:18f. ^ Charles VIII of France received some gloves that were scented with powder of violet, but they were not of French making (Boyle 1996:174). ^ In the earliest usage, bonnet was the woolen thread worked by hand with the needle or a spindle (Boyle 1996:174). ^ Horace Cox, ed. (1905). The Law Times: The Journal and Record: The Law and The Lawyers. vol. CXIX. London: The Law Times. p. 563. ^ a b "List of the evidence in the O.J. Simpson double-murder trial:". USA Today. October 18, 1996. Retrieved December 5, 2008. ^ Chambers, Helen G., and Verna Moulton. Clothing Selection: Fashions, Figures, Fabrics. Page 349. Literary Licensing, Whitefish, United States. 1961. ISBN 1258228173, 9781258228170. ^ "Extreme Cold". Center for Disease control. Retrieved 2010-09-21. ^ "NATO Summit 2006". Rigasummit.lv. 2006-12-15. Archived from the original on 2009-12-21. Retrieved 2010-03-16. ^ "Ministry of Foreign Affairs of Latvia: National Costume". Am.gov.lv. Retrieved 2010-03-16. ^ Brandenburgh, Chr., 'Textile production and trade in Dorestad', Willemsen, A. & Kik, H. (reds. ), Dorestad in an international framework. New research on centres of trade and coinage in Carolingian times (Turnhout 2010), 83–88. ^ "Native American Mittens & Gloves". NativeTech. Retrieved 2010-03-16. ^ "Viking Garment Construction". Cs.vassar.edu. Retrieved 2010-03-16. ^ idiot mittens definition – Dictionary – MSN Encarta. Encarta.msn.com. Archived from the original on 2010-03-12. Retrieved 2010-03-16. ^ "Baby Scratch Mitts pattern – Crochet 'N' More". Crochetnmore.com. Retrieved 2010-03-16. ^ BangShowbiz; Duncan, JJ; Bustillo, Deena; Robberson, Joe; Thomas, Darrick; Wenger, Adam; Newlin, John (June 28, 2010). "Michael Jackson's Jeweled Glove Sells for $190K". Zimbio. Retrieved December 23, 2012. 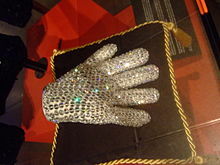 ^ "Michael Jackson Jeweled Glove Sold for $350,000". Funky Downtown. November 25, 2009. Retrieved December 23, 2012. This article incorporates text from a publication now in the public domain: Chisholm, Hugh, ed. (1911). "Glove" . Encyclopædia Britannica. 12 (11th ed.). Cambridge University Press. pp. 135–137.